British forces are stalemated in the trenches of Gallipoli and the Western Front, but in Africa they still have freedom of movement. 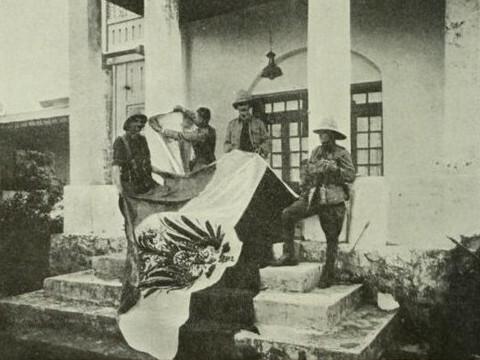 In Germany’s West African colony of Kamerun, the British follow up on their victory at Garua by advancing south towards the town of Ngaundere. The weather turns nasty and the British find themselves marching through a severe storm. However, this turns to their advantage: the Germans and their Askari troops are not expecting anyone to try attacking them in this heavy weather. 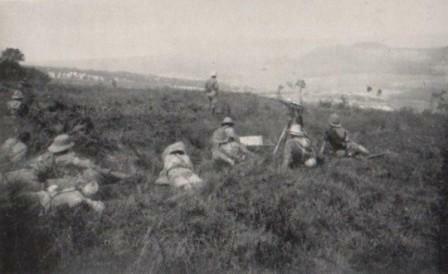 The British catch their enemies by surprise, quickly overrunning Ngaundere’s outposts and then driving the Germans from the town itself. British casualties are minimal. The British do not realise the extent of the victory. The Germans in Kamerun had planned to use Ngaundere and the productive agricultural land around it as the base for their mobile columns. Now that base has been denied to them. The fall of the town further separates German forces in the south of the colony from those besieged in Mora in the north. However the onset of the rainy season makes it more or less impossible for the British to continue their advance. In Mora itself the situation remains grim. The rains at least mean that the defenders are no longer short of water, but they are very low in food, so much so that they have to supplement their rations by raiding the British besiegers to steal theirs. On hearing how badly things are going for his compatriots further south, Major Ernst von Raben gives his African troops the freedom to leave Mora and return to their homes. They all opt to stay and see out the siege. It is a year since Gavrilo Princip shot dead Archduke Franz Ferdinand and Countess Sophie, the Archduke’s wife, triggering the crisis that has engulfed Europe in war. Princip now languishes in an Austro-Hungarian prison, his youth saving him from the death penalty. His co-conspirator Nedjelko Chabrinovitch was also too young to be executed, but other members of their group have been hanged. The members of Serbia’s state security apparatus who provided training and the murder weapons to the conspirators remain unpunished; the failure of Austria-Hungary’s invasions of Serbia have left them at leisure to enjoy their freedom. The Russians have been on the back foot since Germany and Austria-Hungary launched the Gorlice-Tarnów offensive. 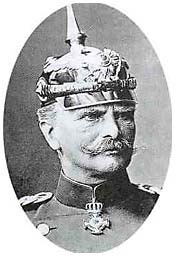 Under the command of Germany’s General Mackensen the offensive has proved a far greater success than expected. As well as recapturing the fortress of Przemysl, the Austro-Hungarians have also returned to Lemberg (also known as Lwów, Lviv, Lvov, etc. ), the fourth largest city of the Habsburg Empire. The Germans and Austro-Hungarians are now beginning to cross the Dniester. It will not be long now before all of Galicia is back in Austro-Hungarian hands. The Germans meanwhile are overrunning much of Russian Poland. In Galicia the returning Austro-Hungarian army receives a warm welcome from the local Jewish community. They had been suffering harsh treatment under the Russian occupation. In recognition of his triumph, Mackensen is awarded Germany’s highest honour, the Pour le Mérite, and promoted to Field Marshal. In German East Africa, British troops continue to advance on the outpost of Bukoba. The Germans and their Askari troops resist manfully but the British have the numbers and better field artillery. When the Germans are pushed back to Bukoba itself their commander decides to order a retreat, lest his force be completely annihilated. They slip away and the British enter the town. The Germans leave in such haste that their flag is still flying over the town hall. With great glee the British take it down. They also dismantle the town’s radio mast. And then some of the British troops start to loot the town. The Frontiersmen seem to be the worst culprits. These are an odd band of ideological imperialists formed before the war and now formally absorbed into the British army. Their love of imperial adventure does not seem to prevent them from helping themselves to other people’s property. They rampage through the settlement taking anything they want and smashing up the rest. They are joined in this endeavour by some of the local African population, but the main impetus for the sack of Bukoba comes from the British. After having their fun the British withdraw; the attack on Bukoba was just a raid. The Germans return to their shattered settlement. Unable to exact their vengeance on the British, the Germans dispense summary justice to any Africans believed to have taken part in the town’s looting. Since Italy declared war on Austria-Hungary, Italian soldiers have carried out a number of local offensives against the enemy, with varying results. But now General Cadorna, the Italian chief of staff, is ready to launch his great offensive against the enemy. The site of the assault is the Isonzo valley. Cadorna’s goals are ambitious. His men are to attack on a broad front, seizing Gorizia and then moving on to capture Trieste before advancing on Laibach and into the Austrian heartland. Cadorna has also ordered ancillary thrusts into the Dolomite mountains. Cadorna hopes that his onslaught will knock Austria-Hungary out of the war, providing Italy with a glorious victory and allowing the seizure of territory long coveted by Italian nationalists. Unfortunately Cadorna has not reckoned for the steadfast defence of the Austro-Hungarians and the extent to which the terrain favours the defenders. The Italians attempt to advance up the sides of mountains against the enemy, but they are caught in barbed wire and butchered by the enemy’s machine guns and field artillery. Little or no real progress is made. Germany’s African colonies are gradually being whittled away. Togoland fell quickly in 1914. South African troops are overrunning South West Africa; resistance there will not long continue. German forces are proving more resilient in Kamerun in west Africa, but the Allies there have the upper hand. In German East Africa things are different. German forces under Colonel Lettow-Vorbeck have defeated the British at Tanga and Jassin. The colony has started to look strangely impervious to the threats posed against it by the British. But the British are not giving up. Today they begin a raid on the German settlement at Bukoba, in the north west of the colony. The British hope to destroy Bukoba’s radio transmitter and to disrupt the flow of supplies from the surrounding area to Lettow-Vorbeck in the east. The British conduct an amphibious operation, crossing Lake Victoria by boat and landing near to Bukoba. The German defenders are confused as to British intentions and are unable to prevent their advance. The Germans (more particularly their locally recruited Askari troops) mount a determined resistance, but by the end of the day’s fighting the British control the heigh ground above Bukoba. French troops have been attacking in the Artois sector since mid May, supported by British attacks near Neuve Chapelle. The French had been hoping to take advantage of Germany’s commitment of its reserves to the Gorlice-Tarnów offensive against Russia. Results however have been disappointing. No major breakthrough has been achieved and much of the local gains have been only temporary thanks to vigorous German counter-attacks. Accepting that no decisive result will be achieved the french call a halt to the offensive. They have suffered some 100,000 casualties in the fighting to the Germans’ 60,000. The Allies draw some conclusions from the fighting. Future offensives will require more men and will have to be made on a wider front, to prevent the enemy plugging any gaps that are opened up. And offensives will have to be preceded by a heavy artillery bombardment, to destroy German defensive positions. In effect this means that future offensives will be much bigger affairs.